This book will most appeal to Roman Catholics and fans of John Michael Talbot. I read it because I am a JMT fan, having listened to his music my whole life, and having read three of his other books (The Lessons of Saint Francis: How to Bring Simplicity and Spirituality into Your Daily LifeThe Lessons of Saint Francis: How to Bring Simplicity and Spirituality into Your Daily Life, The Music of Creation: Foundations of a Christian Life, and Reflections on St. Francis) — and I am a Patristics scholar. I was interested to see what this Francisco-Benedictine musician had to say about the Church Fathers. Oh, and I was pretty sure the book deserved better than a single one-star review on amazon.co.uk! However, I can see why someone might be disappointed by this book. It honestly does not do what it is advertised as doing, not even what the Foreword by Cardinal Donald Wuerl says. It is not an introduction to the Church Fathers. Not by a long shot. This is part memoir, part invitation to the Fathers, part personal and devotional discourse on the Fathers. Furthermore, the sayings and teachings of the Fathers have been digested thoroughly by Talbot’s own life experience as a modern Roman Catholic; this results in them sometimes being taken at face value, and the book often reads, for example, as though he unproblematically assumes that Ignatius of Antioch was a bishop the same way John Chrysostom was a bishop 300 years later. What we do see as we read, though, is a vision of the historic Roman Catholic and Orthodox churches as being the successors to the Fathers. Talbot is aware of the ‘development’ of tradition — he believes, then, the fullness of the Patristic trajectory is found in Roman Catholicism. Therefore, what he is finding in the Fathers is not always the same things their ancient readers or hearers would have found. Instead, what he finds is wisdom for today that speaks to the Roman Catholic soul, finding either timeless gems or modern readings that are themselves worth pondering. That may sound patronising or damning with faint praise. I hope not! I, myself, read the Fathers in my own context for their wisdom. Certainly, the great historical analyses of the Fathers that expound what they meant in their context, what the causes and effects of their tradition were, are of great value. That’s what some of us get paid to do. But all of us, as Christians, should also ask: What is the perennial wisdom and value in the Church Fathers? This is what Talbot offers. Furthermore, you can tell that Talbot, too, has profited from historical-critical research into the Church Fathers. The book begins with the story of the fire of 2008 that destroyed the main building of Little Portion Hermitage, including the library and archives and monuments to Talbot’s recording career. And thus a rediscovery afresh of the community’s, and Talbot’s, own fathers. Then we learn a bit about how Talbot came to Roman Catholicism, and his time amongst Franciscans before founding the Brothers and Sisters of Charity, and taking us through various themes of his life and career to today, when he is an itinerant teacher. Throughout, he offers some of his favourite teachings, fathers, and texts and discusses how they have influenced his life and spiritual journey as a Roman Catholic. 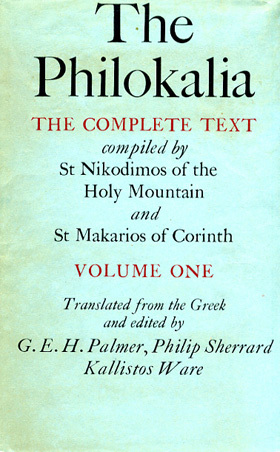 In this book you’ll be introduced to the Didache, St Ignatius of Antioch, St John Chrysostom, St Diadochus of Photiki, St Cyril of Jerusalem, St Cyril of Alexandria, St Irenaeus of Lyons, as well as a host of others more cursorily. I had hoped for more discussion of the content of Chrysostom, as well as of mystagogy — his chapter on mystagogy is more of an example of mystagogy for the Mass as celebrated in the USA today. I had also hoped for a wee bit more on St Benedict (I guess I’ll have to read his book Blessings of St. Benedict for that! In the end, I would recommend this to a Catholic friend or fellow fan of JMT (as I said at the top) who is curious about how we can live in the light of the Fathers today. Demonstrating that point is something that JMT has done admirably, and I hope we can all come to a place where we have become so suffused with Scripture and tradition that the Fathers come naturally to mind at any time. As you know, I spend a certain amount of my time reading the Church Fathers and about the Church Fathers. And I hope that you do, too — or that you will soon! A few patterns of reading are, I believe, quite unhelpful. They are suspicion, the related habit of heresy-hunting, ‘they’re just like us’, and prooftexting. A fifth way is not necessarily unhelpful but could be dangerous, and that is independent, devotional reading. As you know, I dislike suspicious readings of texts, as discussed earlier this year in relation to Perpetua. This is a form of reading that is hostile — the least respectable of all interpretations is always taken. For example, one of my Presbyterian students read Leo the Great’s third sermon on his accession and declared that it looks like Leo is worshipping Peter! The same student later said that St. Francis’ Rule of 1221, in calling for ‘obedience and reverence’ to Innocent III, was distracting people from Christ and directing them to worship the Pope. Sigh. This is the sort of hostile reading that certain kinds of Protestants engage in with anything that resembles a pope or papism. A friend of mine has this trouble with his students at an unnamed evangelicaliberty university who are automatically opposed to anything that looks ascetic or includes celibacy because it looks like Roman Catholicism and doesn’t contribute to evangelism. Be ready for things in the Fathers that look Roman Catholic. They’re there. But do not assume the worst possible reading of all. Please. It tires me. Heresy-hunting is like suspicion. I first learned of this at Phil Snyder’s now-defunct blog Hyperekperissou. In this framework, people read the earlier Fathers looking for later heresies. So Justin is accused of being a Monarchianist or Cassian of being a Monophysite or even a Pelagian (!). We cannot back-read later orthodoxy or heresy onto the earlier Fathers. I believe that this stems from conservative Protestants, probably evangelical, who wish to discredit all Christian history between St. John’s vision on Patmos and Martin Luther on the one hand, and liberal Protestants, probably Anglican (quite frankly), who wish to find a way to justify their own eccentricities and dress them up like ‘progresive’ orthodoxy. You will inevitably find things in the Fathers that sound like heresy to you. Ask what heresy, why this guy looks like a heretic, and why he is still a Church Father if he has allegedly committed ‘heresy’. I once read this series of Christian romance novels called ‘The Mark of the Lion.’ True story. Anyway, what I found remarkable there was that late first-century Christians, rather than looking like the Didache look a heckuvalot like 20th-century nonconformist/free church evangelicals. Like Baptists, in other words. This, of course, was probably derived from not reading the Fathers. More commonly, this looks like something another friend of mine encountered at another evangelical university where a student pulled out Clement of Alexandria and said, ‘Look, third-century Christians believed in justification by faith!’ It is most commonly done by Orthodox who claim that Luke was the first iconographer and have all their modern, Byzantine practices confirmed. This practice, even if not used polemically, completely ignores the historical context of the writers involved. Ancient Christians are very much like us. They believe in Jesus, that faith in him will save us. They pray. They have the same Bible. But they are not us. They are different. Be thankful for the similarities, but be wary of imagining that you and Aphrahat the Persian are the same. This is another dangerous way of reading the Fathers. It is often used in anti-Orthodox and anti-Catholic polemics. 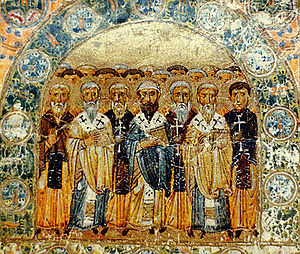 Passages such as St. Epiphanius of Salamis tearing down images in his local church are used in arguments with other Christians to prove to them that they are not as much like the early Christians as they thought. Sometimes the argument from silence is, that no Ante-Nicene Father seems to pray to saints — ha ha! You Orthodox scum are hellbound idolaters! Or it is clear from the Didache that the fasts were not the 40-day long abstinence-fests of Roman Catholicism originally. Ha ha! You Papist pagans have corrupted your own Tradition! This is very, very dangerous. For example, we have Christian images that pre-date Epiphanius. So not all early Christians were iconoclasts. And, although the earliest pray-er to saints I can positively affirm is St. Paulinus of Nola, the Martyrdom of Polycarp seems to include relics and a saint’s shrine; Polycarp died in 155, so he’s not exactly a latecomer to the Christian tradition. Furthermore, although 40-day long abstinences are a development in Late Antiquity and the Early Middle Ages, by Melito of Sardis’ (d. ca. 180) time there seems to already have come into existence proto-Lent. For every prooftext you can draw from the Fathers to fight the Orthodox and Roman Catholics, they’ll find a way to defang it. All you’ll do is fight with fellow Christians and get nowhere. Devotional readings of the Fathers are not inherently bad. This is when you read a passage or text from the ancient Church and say, ‘Wow, this really speaks to my situation.’ Or you say, ‘Hey, this helps with x, y, or z modern problem.’ Or something like that. This is not a bad way of reading. I do it. I even do it on this blog. But we have to distinguish between what the Fathers may say today and what the Fathers meant. Sometimes they are the same thing. Sometimes they are not. To help you distinguish, most modern translations of the Fathers come with handy introductions. Some, such as certain volumes in the Ancient Christian Writers series, have commentary. There are also handy introductory books such as Routledge’s Early Church Fathers series. Resources like these can help us distinguish between what Leo the Great means to me as a 21st-century Christian facing all the challenges this world holds, and what Leo the Great meant as a fifth-century Christian facing all the different challenges his world held. I hope you can avoid these kinds of readings. The Fathers, I believe, are best read on their own terms and for your own edification — not as fuel for the battles for Christian identity that have raged since before 1054.